Combine the best of the best! We recommend you start your trip in Bergen (obviously). But if you don’t, that’s OK too. In fact, if you’re in Oslo, that means you get to enjoy Bergensbanen on your way here. There are four daily departures from Oslo to Bergen which take you through some of Norway’s most magnificent landscapes. The trip is about 7 hours, but this isn’t transportation – it’s an adventure. Time to spare? Hop off the train in breathtaking Flåm and spend the night there. Next day, enjoy the beautiful train ride on the Flåm Railway, continue by boat to Gudvangen, taking in the beautiful fjord landscape, then catch the bus to Voss and then the train to Bergen. This tour is fittingly called "Norway in a Nutshell" – and will give you a little taste of the variety Norwegian nature has to offer. Any trip to Norway should include a visit to Bergen, if nothing else for its easy access to the famous fjords and fjord cruises. 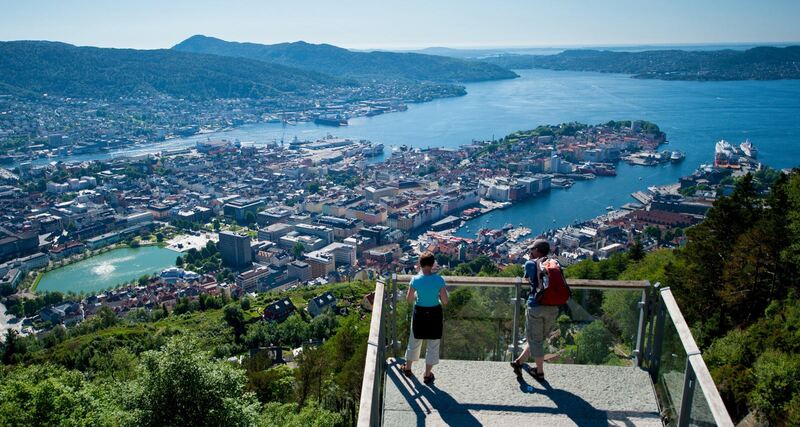 But while you’re here, hop on the Fløibanen funicular and get a stunning view of Bergen from above. A fan of fjords? Who isn’t! And you’re in luck – Bergen is surrounded by them. From Mount Fløyen you get to enjoy both the sight of fjords, mountains, landscapes and cityscapes, all in one great view. No wonder this is one of Norway's most famous attractions. Time to spare? The picturesque Fish Market lies at the heart of Bergen. For 800 years this has been a meeting place for merchants and fishermen. Fancy fresh fish, seafood – or even fruit, berries and vegetables? This is the place to visit! The northern parts of Norway are incredible throughout every season. A short plane ride away from Bergen lies Tromsø, with its symphony of northern lights during winter – and it’s neverending sunlight during summer. Don’t really care that much about lighting? Don’t worry. In Tromsø you can go whale spotting, dog sledding – or fish catching. Don’t really care that much about animals either? Tromsø is great for both hiking in the wilderness, and chilling with the more urban locals. They’re pretty friendly. Time to spare? In Tromsø, there are safaris specifically for reindeer feeding. Do we even need to say more? If you want to see both the fjords and the north, you can fly between Bergen and Tromsø with Widerøe. A short plane ride south of Bergen, you’ll find charming Stavanger. Here you should definitely take a stab at a truly Norwegian past time: hiking. Preikestolen (Pulpit Rock) is a short, and fairly easy hike. But at the top, you will be greeted by a view of Lysefjorden, 600 meters below, that is quite simply unforgettable. Want to see the fjords from the water? This cruise on Lysefjorden will allow you to do just that. Time to spare? Still not close enough to the water for you? Well, the Stavanger region actually has beaches! Why not try your hand (or feet) at surfing? Just make sure to rent a wetsuit to stay warm in the Arctic Sea. Useful tip: How to travel between Stavanger and Bergen. Have you got your list of places to visit in Norway ready yet? If you need more inspiration, check out the best fjord cruises is Norway and find the right one for you!